Snow arrived in our corner of the world this weekend, and as the four of us watched the pretty little flakes swirling outside the window, our thoughts turned happily to Christmas. We spent most of yesterday decorating our home for the holiday season, and while Noah and Will are the ones who show their excitement the most, we're all looking forward to weeks filled with family and friends, surprises, delicious foods and cherished traditions. One of our favourite ways of making the wait until Christmas Day a little easier on the boys is keeping a special calendar with them. About five years ago, I was inspired to create a calendar of our own after seeing some photos of beautiful and unique ones in a decorating magazine. 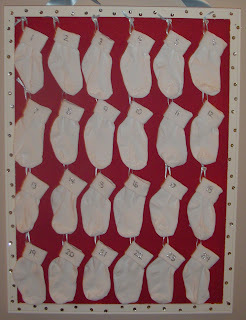 I took an old bulletin board I had lying around, painted it red with white trim, attached ribbon to twenty-four little white baby socks, added numbers on them with silver glitter fabric paint, and used clear pushpins to attach the socks in rows on the board. While my calendar certainly didn't compare to the ones that had inspired me, I was pleased with the end result and the boys were thrilled to know that there were little treasures tucked in the socks for them, one for each day leading up to when Santa would arrive. 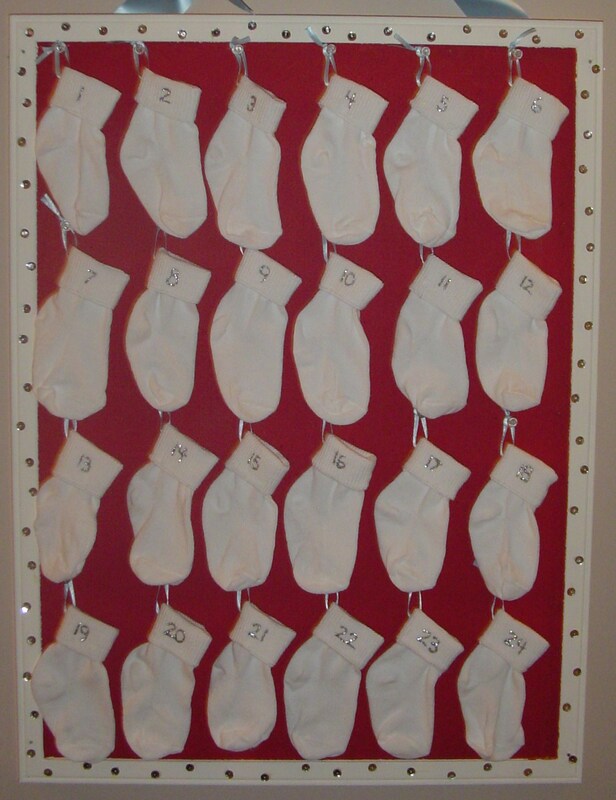 This year I noticed that the little white socks were growing tired looking, and I went out in search of a new idea for a Christmas countdown calendar, since both Noah and Will still eagerly anticipate its appearance every holiday season. I came across this charming little cottage calendar with numbered doors for each day, and decided to bring it home rather than making something new. I have filled the space behind each door with fun surprises for the boys: Christmas shaped Silly Bandz, spinning tops, Santa card games, snowman erasers, Lego pieces, little squares of dark chocolate, peppermint candy and the like. I look forward to seeing their smiles each morning (beginning next week!) 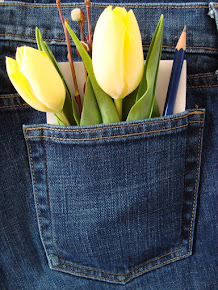 when they peek behind the day's door to discover their treasure. When you're a child, waiting for Christmas can seem to take an eternity! Having a little calendar like this at home gives young ones something to look forward to every day while waiting for the special one when Santa will finally arrive.